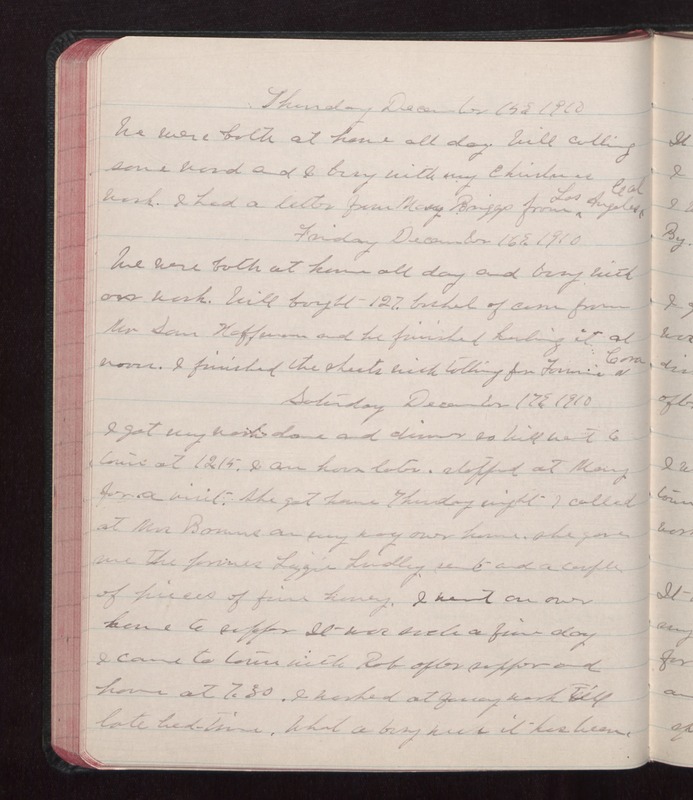 Thursday December 15 1910 We were both at home all day. Will cutting some wood and I busy with my Christmas work. I had a letter from Mary Briggs from Las Angeles Cal Friday December 16 1910 We were both at home all day and busy with our work. Will bought 127 bushel of corn from Mr Sam Hoffman and he finished hauling it at noon. I finished the sheets with tatting for Fannie & Cora Saturday December 17 1910 I got my work done and dinner so Will went to town at 12.15. I an hour later. stopped at Mary for a visit. She got home Thursday night. I called at Mrs. Browns on my way over home. She gave me the [illegible] Lizzie Lindley sent and a couple of pieces of fine [honey?]. I went on over home to supper. It was such a fine day I came to town with Rob after supper and home at 7.30. I worked at fancy work till late bed-time. What a busy week it has been.